There has been a sense of oneness I have felt in my life cutting across all barriers of age, gender, religion, nationality, race, skin colour, wealth and status. I have no idea how the feeling arose. In fact, I know for certain that it is not merely a feeling, it is the only truth. In essence, we are all one. There is some indivisible unity of life and creation that remains intact no matter what the conflict and differences on the surface. This essential unity characterises the whole of humanity and ultimately, even the whole of creation. This is not a belief to be pursued or an idea to be advocated; it is not an experience that is to be remembered or repeated, it is not a doctrine to be followed. To me, it is a fundamental and final fact. This essential oneness is what we are. Our entire lives are based on an unbroken continuity of observation. We call it “I”. The “I” is not the body because the body is forever changing; it is not the mind, for this is in unceasing flux; it is not the intellect because our ideas are also forever dynamic. Yet, b our awareness that enables our very understanding is unbroken and continuous and so is our self identity “I”. The error seems to be our perception of separateness based on sensory, mental and intellectual limitations. There is a fundamental misconception of separateness that is so fundamental that it underlies all our attempts to discover truth, whether by means of religion or science. It is this misconception that is the great illusion and the great lie, the great veil that hides our essential oneness. The oneness is felt in the heart in an experience that defies words. It is not an experience that is repeated. It is a realisation that fundamentally and radically transforms our entire lives. The transformation is fundamental and alters the very way we look at things; the sense of oneness becomes the basis of all our understanding. I believe this is the lasting bliss we all seek and fail to find in any material or intellectual acquisition or achievement. In a very real sense, this unbroken unity of life and creation is the hidden essence in each of us, our deepest self. To discover this is the journey of the human quest for happiness and each of us seeks it in a different way. Each of us walks this journey of self discovery. Whether we know it or not; our quest for lasting bliss is this quest. In May 2002, as I thought of the similarity of the human predicament among human beings everywhere, regardless of manmade divisions of nationality, race, status, wealth, religion, beliefs and so on, I wondered if it was possible to reach out to another human being simply as one human being to another. I wanted to set aside criteria that divided us as human beings on this planet, I felt a spontaneous wish to reach out in oneness, to meet each other as essentially two waves in the same ocean. My innate sense of oneness urged me to reach out, not to unite in the name of some doctrine or dogma but to reach out to another simply because we are all human. To this end, I emailed several people in various parts of the world discussing the possibility of keeping in touch to share the human journey that is our life. There was no desire for anything except to reach out in oneness, to actually share and celebrate the oneness that unites us all. I did receive a few replies and I continued to correspond with a few people from different countries discussing issues common to human beings everywhere. Love, fear, happiness and sorrow – these were some of the issues we shared as human beings, cutting across all barriers of age and gender, nationality and skin colour, religion and belief. One gentleman I spoke to suggested I start a Yahoo group as a forum to share. I did so and started writing my thoughts spontaneously to share myself, to share what is essentially human in me and in you, the humanity, the love and laughter, the joy and sorrow that we all share merely by the fact that we are all human. As I wrote spontaneously, as I actually emptied myself, pouring my thoughts in the form of short essays on various themes of human interest, I received many responses. It seemed that I had actually touched the essential ingredient that unites us all. For, I received many heartfelt responses from people all over the world, cutting across barriers of age and gender, nationality and race, skin colour, status and wealth, religion and belief. It seemed distinctly possible and even spontaneous and easy to share on a purely human level, sidestepping all manmade barriers that divided us. This celebration of the human journey, this oneness we all share is what I sought and still seek to celebrate in my writing. Eventually, as I wrote, I felt a magically ecstatic tranquility in my life. It was as if, by reaching out, I had simultaneously reached in and touched, deeply, my own heart. The sense of joy and pleasure was echoed by many readers who felt touched by my writing. Many spoke from the heart, offering their thoughts; many wrote to express appreciation and many wrote to express admiration and gratitude. It was actually, as it turned out, a celebration of oneness. There were occasions where I had to sidestep issues and individuals that seemed to promote division rather than oneness. In this journey, I realised how very binding and limiting so called learning and knowledge can be. People who seemed to be most clever and analytical were often those with the most pre-conceived notions, those who set out to prove conclusions they began with. I realised the futility of acquired knowledge and learning in grasping facts of fundamental and final significance. In this sense, learning could be merely clutter in our minds, preventing us from seeing with open minds. The simple and the less learned were less burdened in this sense, they had less clutter to empty their minds of. Thus, it seemed to me that we needed to empty ourselves of all our accumulated impressions and patterns of thinking and look with the eyes of a child if we were to discover the oneness that was fundamental in our lives. The oneness did not imply giving up anything we valued. It was an intrinsic sense of unity that each human being could rediscover within himself. With this discovery would end the sense of separateness. Therefore, it would be the end of sorrow, fear and conflict in the mind, paving the way for joy and contentment. Joy and contentment are not an end result to be achieved by sensory pleasure or material accumulation. Intrinsic joy and contentment are our true nature, the very ground of our being. Babies are blissful spontaneously and naturally. They are not alienated from creation, they wonder with total receptivity and smile at anyone who cares to smile at them. As I wrote, I found that I wrote “straight from the heart”, without conscious thought or effort. The reaching out, by means of writing, was effortless to me and it gave me great joy. I learnt, from the responses I received that my writing also gave joy to several people who read my essays. One thing led to another and eventually, some readers asked me whether my writing has been published. I said “no” and queried whether they thought my writing worthy of publication. Almost every one I asked said “yes”. I then decided to check it out by posting my essays in some writers and publishers online groups. There, too, there were positive responses. A few professional, published writers became my readers. One of them, now no more, had about 30 or more published novels. He was also of the view that my writing could indeed, be published. These were nice to hear and know; yet, my central and primary motivation has been and remains my desire to reach out to fellow human beings in a spirit of oneness. To me, this is its own reward, the rest are mere details. In Oct 2002, the director of the editorial board of one of the oldest and biggest mainstream publishers in the United States gave final acceptance to my manuscript for publication as a book. This was until they discovered that I was not a resident of North America. On learning this, they regretted that policy did not permit them to publish my work. This was disappointing; yet, the source of my inspiration was an inexhaustible source of strength, the essential oneness of humanity and creation. Manmade barriers were hurdles; yet, they were not insurmountable. So, my quest for a publisher continued. Since I wrote in the English language and many of my readers were based abroad (I live in Bangalore, India), I continued my search for a publisher in India and abroad. As a focal point for my readers, I created a website with links to my essays and to provide news of my progress in finding a publisher. The website also enabled me to acknowledge and express my gratitude to those who had appreciated and supported my work. The website was created on January 2nd 2002, January 2nd happened to be my birthday. As I browsed the net to find a publisher, it was my urge to reach out in a spirit of oneness that kept me going. My search was relentless and I was determined to keep trying regardless of how many times I failed. This was natural because I was expressing my deepest thoughts in my writing, reaching out in oneness and opening my heart to share the essence that makes us laugh and cry, the essential humanity that makes us one. In one of my browsing sessions, I stumbled upon Truborn Publishing, owned by my now dear friend Sincere Wise in London. www.truborn.com Since the site mentioned new writers specifically, I saved the contact email address in my address book. I had barely noticed what I did; this, however, was to prove the decisive turning point in the lives of Ashok Gollerkeri and Sincere Wise. I emailed a sample of my work to Sincere and in fact, did not receive any reply. To be honest, I did not even notice that I had not received a reply. This was so because I was sending out dozens of emails a day to publishers and just could not keep track of whether they responded or not. I never emailed a publisher for a second time. So, it was in fact providential that I had saved Sincere’s email address in my address book. Once my personal website was up and ready for viewing, I wanted to share it with as many people as I could. So, I emailed the news to all those who were on my address book. This included Sincere Wise, founder of Truborn Publishing, London. He was kind enough to respond this time around. He had, apparently, visited my website, browsed my essays and really liked my writing. Once I received his letter of appreciation, I responded and since then, we have been in regular touch. My deepest gratitude is due to Sincere for his great courage, vision and humility. It called for a pioneering and inspired spirit to publish an unknown author who wrote about the ecstasy of one’s deepest self. Certainly, it called for an extraordinary depth and breadth of vision and a love for the oneness that my writing expressed. All these were fortunately combined in the person of Sincere Wise. He had a wise head on his young shoulders. 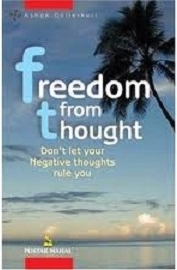 Eventually, our combined efforts have enabled us to place my first book “Freedom from Thought – Book.1” before you, the reader. It is to touch your heart that I write and it is my oneness with you that I celebrate and share. Thank you for expressing interest in my work and thank you for buying my book. Your love and support is very precious to me. So, dear reader, this has been my journey, this is the story of how “Freedom from Thought” came to be. It has called for relentless effort and tireless energy on the part of both publisher and writer. The effort has been to reach out to another human being in a spirit of oneness, to celebrate our oneness. You, our reader are that human being. You have been most supportive by stepping forward to buy my book. Thank you very much. I will continue sharing my journey of the exploration of human consciousness and human life in my forthcoming books – Freedom from Thought- Book.2 and Book.3. These three volumes, together, will have 105 of my essays. We will walk together sharing this journey that is our life, sharing both our laughter and tears, both our joy and sorrow; for to live is to share and to share is to celebrate our oneness with love.